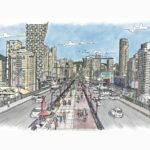 The City of Vancouver plans to convene a community panel to determine the best route for a new arterial road and overpass through the False Creek Flats. The city says a new arterial road and overpass is needed due to delays at the Prior/Venables crossing. A recent analysis determined the crossing experiences an average of 12.5 blockages a day at around 6.5 minutes each. CN Rail recently increased rail traffic on the route. 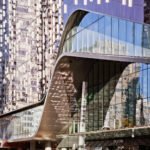 It’s hoped the new route and overpass will enhance safety and help alleviate congestion, as well as support Vancouver’s role in Asia-Pacific Gateway trade by reducing the impact of rail movement on arterial traffic. 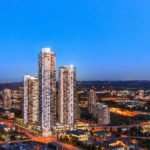 The new arterial road should also help ease traffic volumes on Prior and Venables through the Strathcona neighbourhood, as well as provide access to the future site of the new St. Paul’s Hospital. 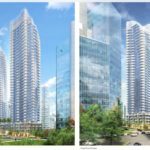 It will also connect with the new Pacific Boulevard. 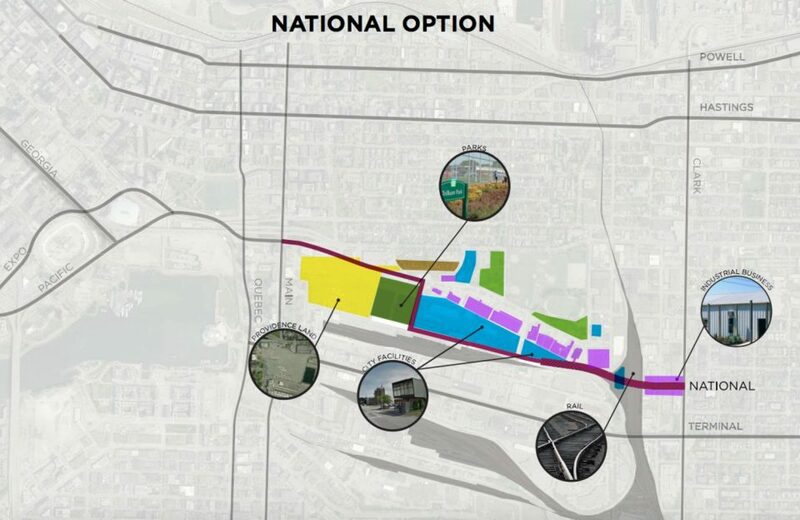 The National Avenue option runs along the north edge of the new St. Paul’s Hospital site, past Trillium Park and along Thornton St, onto National Ave to Chess Dr. The overpass begins at Chess Dr, through the Fire Training Facility, overtop the railway track, Vernon Dr, and aligns with Grant St to connect with Clark Drive. 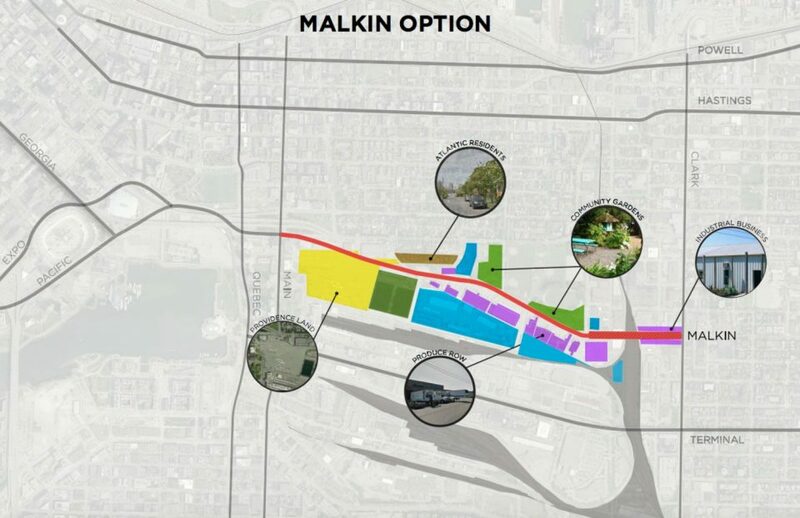 The Malkin Ave option runs along the north edge of the new St. Paul’s Hospital site and on the existing alignment of Malkin Ave. The overpass begins at Raymur Ave, passes over Glen Dr, the railway tracks, Vernon Dr, and aligns with Charles St to connect with Clark Dr. 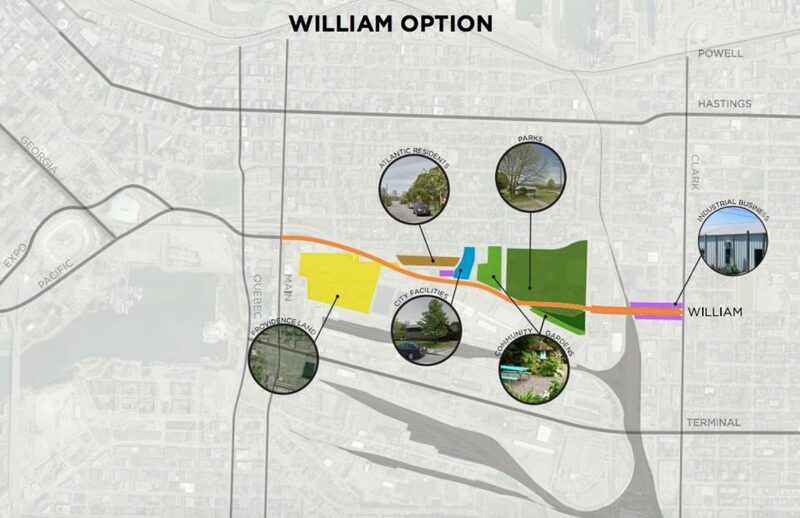 The William St option was dismissed in an early phase of exploration due to its impact to Strathcona Park. 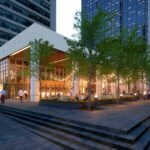 During engagement on the other options, project partners impacted by the Malkin St option requested that we consider it as an option. 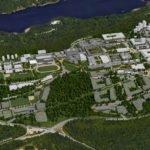 This option runs along the north edge of the new St. Paul’s Hospital site, on the existing alignment of Malkin Ave, and through Strathcona Park between Chess St and Raymur Ave. The overpass begins at Raymur Ave, passes over Glen Dr, the railway tracks, Vernon Dr, and aligns with William St to connect with Clark Dr.